Little Red River Cree Nation has partnered with the Alberta government to install solar panel systems on two community buildings. 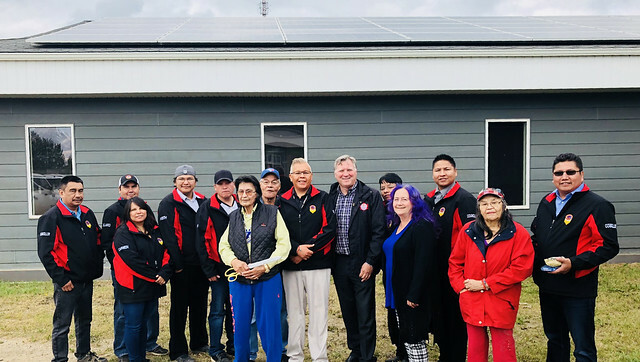 Elder William Seeseequon, Little Red River Cree Chief Sewepagaham, Minister Feehan and MLA Jabbour in front of the Little Red River Cree Nation’s John D’Or Administration Building with new solar panels. The project will reduce greenhouse gas emissions, make energy bills more affordable and support local jobs. With support from Alberta’s Indigenous Solar Program, Little Red River Cree Nation installed solar panels on Kayas College and their band office. Funds saved from reduced utility costs – approximately $7,000 per year – will allow Little Red River Cree Nation to reinvest in other community priorities. The solar panels are expected to generate 55.1 kilowatt hours per year. They will also prevent about 880 tonnes of greenhouse gases from entering the atmosphere, which is the equivalent of taking about 190 cars off the road. The $162,168 grant is part of $35 million in funding available in 2017-18 for Indigenous climate leadership programs that help Indigenous communities respond to climate change and provide greater energy security. These initiatives support the Alberta government’s commitment to implement the principles of the United Nations Declaration on the Rights of Indigenous Peoples. The Nation also received $67,247 through the Alberta Indigenous Climate Capacity Program to assist in climate-related training, and $171,745 through the Alberta Indigenous Community Energy (Audits) Program to assist the Nation in performing energy assessments on community-owned buildings to help them identify energy conservation opportunities.